Practicing yoga is one of the most effective ways to stay fit and healthy. If you have tried all other means like gym, aerobics and other types of exercises and could not achieve what you have desired, yoga is sure to help you get the results you desired. Yoga includes asanas, breathing exercises or pranayama and meditation. But there are some types of yoga which consists of only meditation and healing. Zen meditation, maha yoga, nada yoga etc are some such yoga. Nada yoga is also known as ‘musical meditation’. It ‘means ‘union through sound’. It can be divided into two parts, which are anahata and ahata. Anahata refers to the internal aspects of nada yoga and ahata refers to the external aspects of this yoga. Vaikhari – This is the audible sound. Madhyama – This is the mental sound. Pashyanta – This is the subconscious sound. Aranada – This means transcendent sound. In simple words you can say that nada yoga is ‘union with self through music or sound’. Anyone can practice it, irrespective of one’s cats, religion or creed. This is regarded as the most preferred path to self-realization. To do this yoga, you have to choose a place in your home, where it is very quiet and peaceful. This allows you to practice this yoga without any disturbance from outside. Make sure that you have a yoga mat or a piece of cloth, which is termed as ‘asana’, with you. You can sit on this mat and practice nada yoga. Sit on the mat in a position in which you are fully comfortable. You can sit cross-legged or in sukhasana, padmasana, ardha padmasana or vajrasana posture, whatever is comfortable for you. Once you are seated comfortably, close your eyes and concentrate on your breathing. Inhale and exhale deeply as you focus on your breathing. Practice prana dharana. As you sit on the mat, keep your hands on your knees and place them in dhyana mudra. This helps in increasing your concentration power. It is also beneficial for producing positive energy around you. As you begin this session, you can relax your mind and body by putting on some calm and relaxing music of your choice. Choosing the right kind of music is very important for this yoga. Make sure that the music you put is soft, soothing, serene and divine. It should have the power to heal your mind and soul. The music must never be loud and disturbing. Let it be an instrumental music that does not contain any words. Sounds of human beings and words can detract you and make meditation difficult. Soft music played by a veena, sarod, sitar, flute or a piano is good for this. Now sit quietly and focus fully on the music. Try to immerse yourself in the music, so that you only hear the sound of the music and nothing else. Immerse deeper and deeper into the music. Continue this practice daily and listen to the same music. Give your full attention to the music. Slowly shift your attention from the music to your inner/subtle sound. Now you will be able to hear the anahat sounds, which is the subtle sounds that come from within, as well as the ahat sounds which are the sounds that come from outside. When you start being aware of your inner sounds, give your full attention to the sounds from within you, as you did in the case of your music. Relax your mind, body and soul, so that you enter into a deep meditative state. Remain in this meditative state for as long as it is possible for you. There is no specific time period for meditation. As you continue to practice nada yoga, you can slowly stop listening to the music, as your attention will be more focused on the anahat sounds. Eventually you may not need the music at all. But you may put it on if you enjoy it as you practice nada yoga. at this stage it is entirely up to you whether you want to put on the music or not. After the yoga session you have to release yourself from this pose. For this you have to first open your eyes very slowly, release your hands from dhyana mudra and then place your hands on your eyes to transfer the energy that is generated into your body. It s very effective for calming and relaxing your body as well as your mind and soul. By doing this yoga daily, you can enhance your subconscious mind. You can increase your concentration power with this yoga, so that you can do all your works better than before and with more concentration. Nada yoga is also an excellent way to increase your thinking capacity. By practicing nada yoga regularly, you can develop an atosphere of joy, happiness and harmony. This makes you feel happy and removes depression and all negative thoughts. 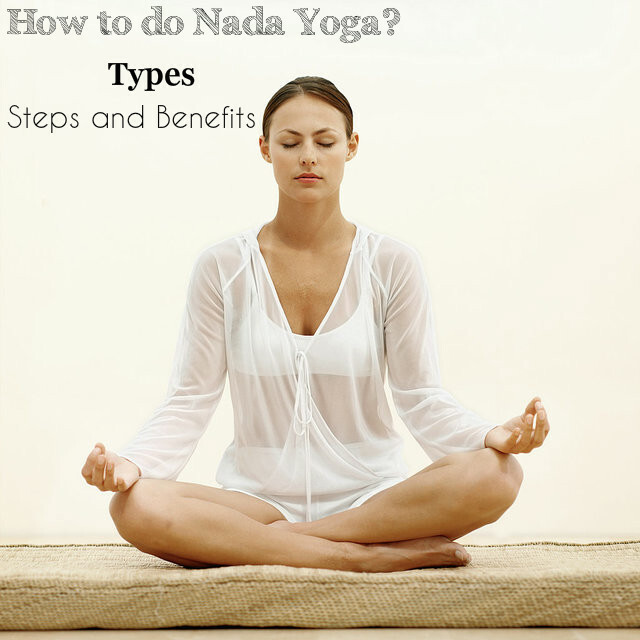 Practicing nada yoga is an effective way to get rid of fear, anxiety and aggressiveness. So, forget all your worries, drawback and problems, and start practicing nada yoga. Soon you will see the change it brings in you. Your body, mind and soul will get refreshed and rejuvenated and you will start leading a happy life. Strength Training Exercise – What is it – Benefits for Body?